Want to forget the battle of mealtimes? Rebecca Cobb‘s illustrations summon the everyday with so much accuracy and tenderness that it is hard to resist them. Proof is that in the last 6 months, my son has borrowed Lunchtimes at least 3 or 4 times from the two nearby libraries. Now, if this is not a sign that we need to buy this book (or to get her new book The Something) I don’t know what is! 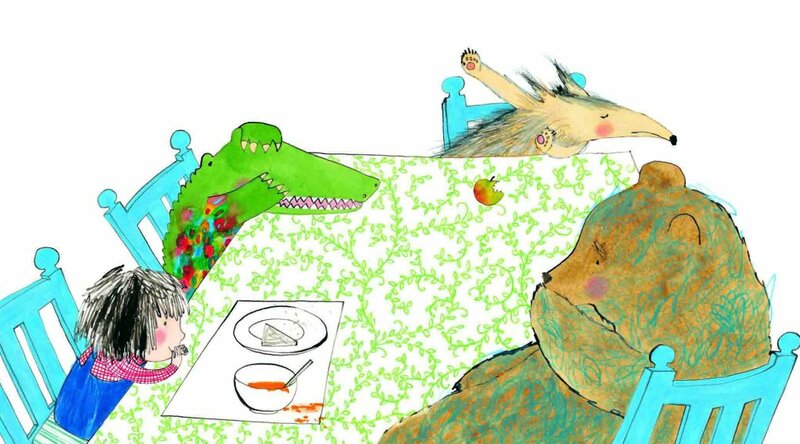 Because meal times can be a battle regardless of age, this simple story can be enjoyed by children as young as two years old. 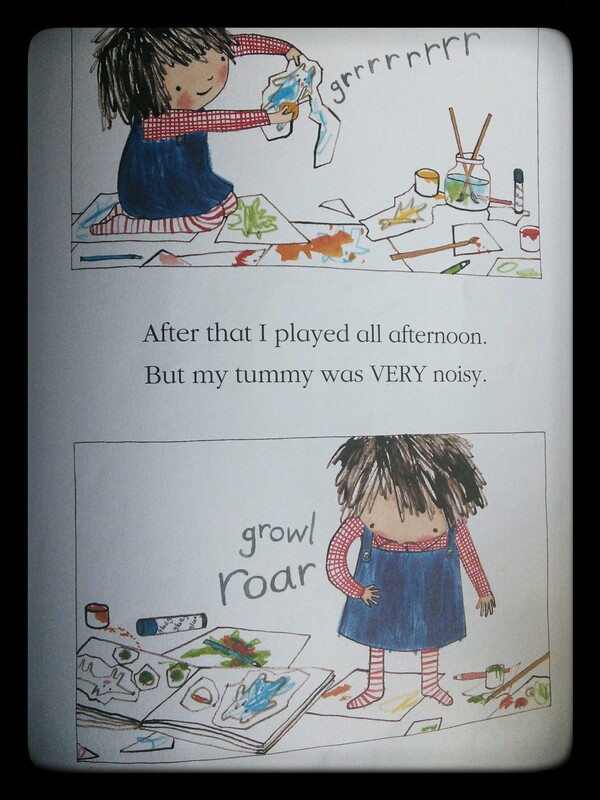 On the first two pages, we see a little girl, engrossed in painting, who is happily focusing on colouring a crocodile. But her mother, because it is lunchtime, is having none of her ‘I’m too busy’ talk and sends her off to sit at the table. So what do you think she does? 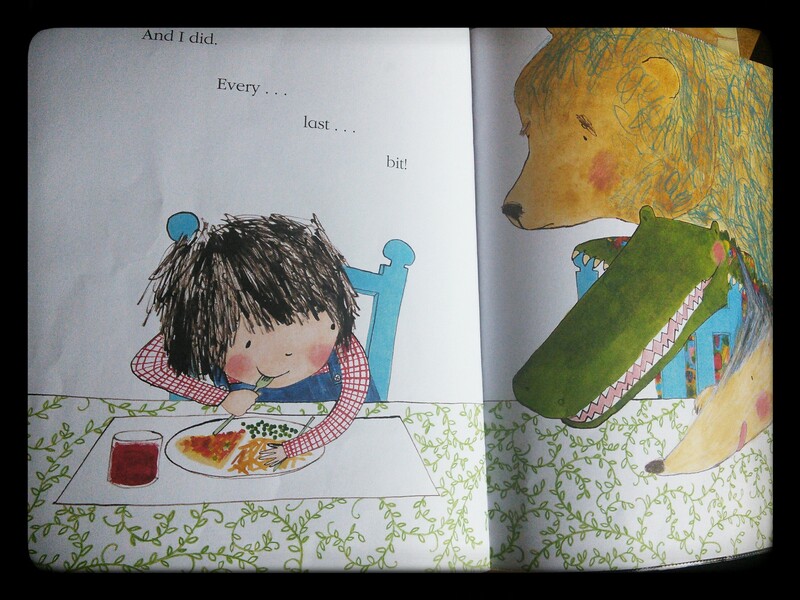 Like a good girl, she sits down and waits, waits, and waits until she gets asked by a gentle looking crocodile, a woolf and a bear whether she is going to eat that yummy looking lunch. After explaining how disgusting children taste, they it eat all up and kindly thank her. Finally, she can go back to her activities, even if some rumbling noises tend to interrupt her otherwise joyfully busy afternoon. Now can you guess what happens at dinnertime? Not only does the little girl run to the table, but she also gobbles up her whole plate! The animals’ disappointed look is priceless and it makes my kids laugh every single time! 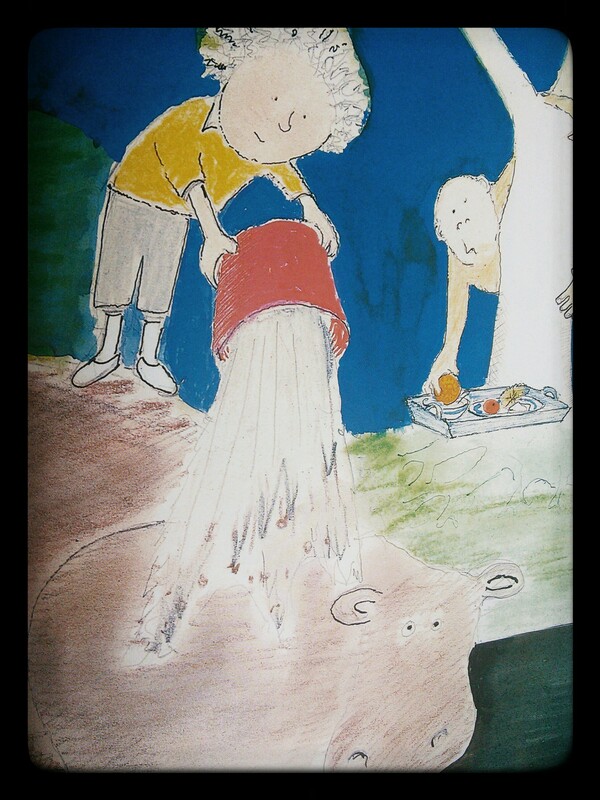 This funny story made me think of one we read often by John Burningham called Where’s Julius? Julius is just as busy building a den, keeping hippopotamuses cool with buckets of water, or throwing snowballs in Russia, and his parents decide to go with his fantasy world rather than fight it. 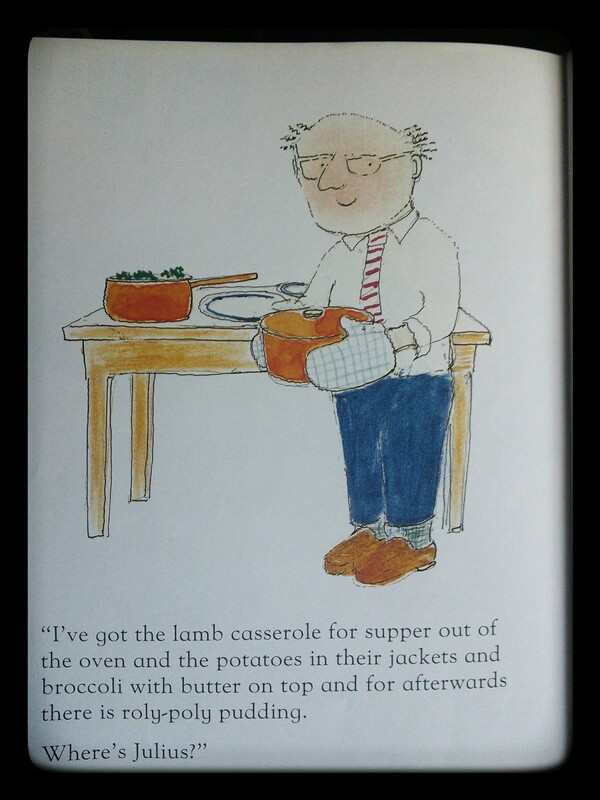 I love Burningham’s book because both parents cook in turn elaborate 3-course meals and carry on trays to Julius as if he was royalty! Besides after each delivery, there’s always a cheeky creature (monkey, goat or fish) to steal at least some of the meal! Granted these books won’t necessarily convince your child to eat everything you place on their plate, but they will show them that mealtimes can be pleasant opportunities to chat together and that they are not an obstacle to having ‘imaginary fun’ together. Rebecca Cobb’s publisher has a lovely placemat available for you to use as a drawing prompt, if you ever needed one (my children are always happy to be scribbling away). I can just imagine how, once laminated, this could be used as a great prop to keep your little ones busy at the restaurant while one is waiting for their meal to arrive! If you have kids and love books, theatre and all things cultural, then have a browse and enjoy! La tête dans les nuages et le nez dans les bouquins? Bienvenue chez nous!